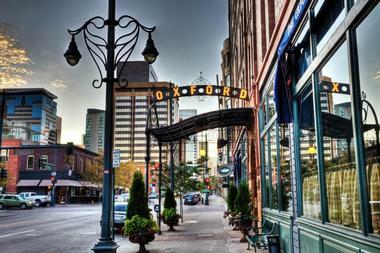 As the oldest hotel in downtown Denver, the Oxford Hotel is one of the city's landmarks. 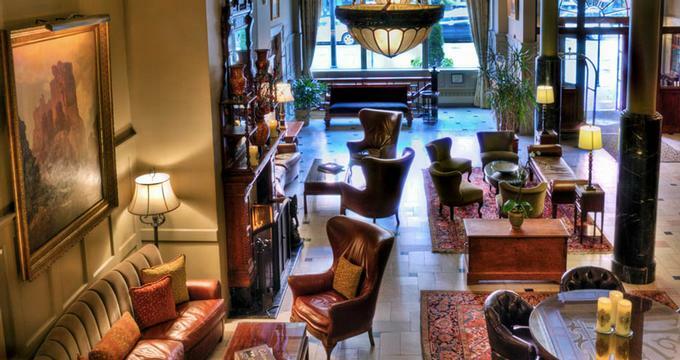 From hand carved art deco panels to bow-tie bellmen, stepping into the hotel will throw guests back in time. It is centrally located on 17th Street in the historic Lower Downtown area (LoDo) with close proximity to many of the city's main attractions. As such, the establishment has been popular with couples or families seeking a weekend city getaway and business travellers alike. Throughout the years, the hotel has rejuvenated its infrastructure and operations to upgrade its facilities with 21st century comforts, while staying true to its unique heritage. 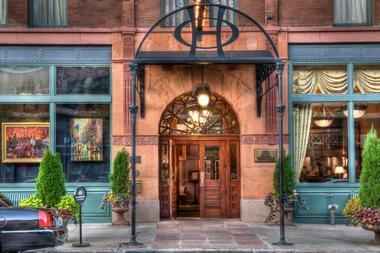 A replica of the original door archway now fronts the hotel's entrance to welcome guests into its extravagant interior. Hand carved art deco panels have been carefully preserved, while the carpets were carefully replicated based on its original design. Guests are welcomed to immerse in the luxurious charm of the hotel rooms, or simply to have a great night out sipping a tipple at the hotel's award-winning cocktail bar. Guestrooms in the Oxford Hotel are designed to make sure each one is one of a kind through blending old and new elements. Guests will take comfort in the modern amenities provided in all rooms, including complimentary unlimited high-speed wireless internet, flat-screen HD television and Bose stereo speakers with iPod docking station. They juxtapose with the historical elements that are incorporated into the décor. Tastefully decorated in either Victorian or Art Deco theme, the solid dark wooden furniture, rich drapery and antique headboards give the rooms an air of timeless, classic elegance. Guests will be able to expect conveniences including 400-thread count Egyptian cotton sheets, plush robes, slippers and hair dryers inside their rooms. Alongside is also a wide range of complimentary room services from evening turn-down to shoe shine services to take advantage of. 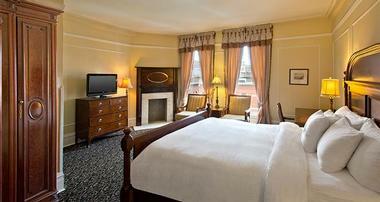 For fantastic views overlooking the LoDo, you can request for rooms that are facing the street. However, these rooms tend to be noisier, so light-sleepers should try to get rooms located on the higher floors. Although rooms facing away from the streets tend to be quieter, views are usually limited to brick walls. Those willing to splurge a little more can book into the premium classic rooms or suites that come with a 5-piece bathroom and vintage claw foot tub. During the Victorian era, the claw foot tub was often considered as a luxury item, and has been reserved exclusive for use by the aristocrats and those in the upper echelons of the society. Even up until today, it is still seen as a fancy bathroom fixture. Do get the rooms with these tubs and seize the opportunity to soak the day away in them. To complete the experience, call the 24-hour room service for a glass of champagne that would pair well for luxurious deep-soak bliss. The hotel's strategic location places it within walking distance of dozens of dining establishments. 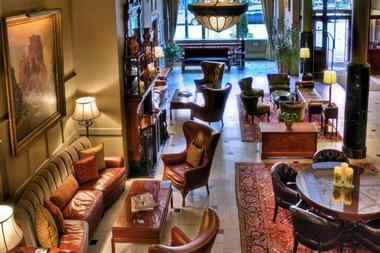 Complimentary coffee and tea are available in the lobby and on the second floor. For those too fussed to leave the room, ring the 24-hour room service for the drinks to be sent to your doorstep. The Oxford Hotel boasts housing Denver's first post-prohibition bar, opening just one day after the prohibition was repealed in 1933. As the oldest bar in the city, the legendary Cruise Room initially made its name serving martinis, and more recently, upscale cocktails. One of its most popular drinks is the Red Widow, which is a peach vodka, champagne, elderflower liqueur and jalapeno juice concoction. Another must-try would be the Bourbon Potation, a spicy herb mix of local Colorado bourbon, ginger liqueur, apple butter and fresh sage. Also known for its neon red lighting and orange hued walls, the Cruise Room was styled after a lounge on the ocean liner Queen Mary. With intimate and cosy booths and walls adorned with beautiful ceiling-to-floor Art Deco murals, the bar has been a long-time popular destination for gatherings and dates. The Oxford Club that located in the hotel offers a complete health and wellness solution. It is house inside a historic Victorian-style building built in 1912 that allows visitors to walk into a rustic oasis of peace and calm. From aestheticians to massage therapists to personal trainers, the club has a team of professional staff that promises to deliver top-notch customer services. As a full-service spa, guests are spoilt for choice with an assortment of head to toe pampering services. One of its signature treatments is the Almond Joy Experience that aims to nourish and moisturize the skin. It uses specially formulated products from a company based in Boulder, Colorado. Visitors will receive a full-body exfoliation with coconut sugar scrub followed by a warm chocolate body wrap to draw the impurities out. Other services would include chemical peels, underarm waxing, haircut, manicure and pedicure. These treatments seek to help spa goers relax and rejuvenate so as to bring out their outer and inner shine. Those seeking for a good sweaty workout can head to the fitness centre at the Oxford Club. It is one of first gyms that opened in downtown Denver and remains as one of best of its kind even up until today. With a wide range of equipments, users can easily switch from doing weights to cardio and leg training. Members also get to join the daily fitness classes, including yoga sessions, spin classes and barre workouts. Private training sessions with personal trainers are also available to help users achieve more focused and specific workout plans. Locker rooms are available at the gym that comes with showers, a eucalyptus steam room, hair dryer, robes and slippers. Hotel guests receive free access to the fitness club and steam room, making it easy for them to workout regardless of their schedule. The Oxford Hotel offers 10,000 square feet of meeting space for hosting weddings, large gatherings or meetings. Given its central location as well as availability of quality accommodation and catering options, they can cater for all business or entertaining needs. There are seven different meeting spaces that could host between 10 and 250 people. The largest of which is the Grand Ballroom that spans 3000-square feet; as for more intimate settings, the Brooks Room could comfortably fit in 30 people. Business travellers will appreciate high-speed Wi-Fi that is available in all rooms as well as throughout all public areas in the hotel. Alternatively, there is also a business centre located on the second floor with computer and printing services. For those looking for temporary office spaces in downtown Denver, executive offices are up for rent just adjacent to the hotel at the Oxford Annex Annex Executive Offices. For wedding couples, the rustic charm and opulent design of this Denver landmark makes it an unforgettable reception venue. The hotel offers dedicated and experienced coordinators who will work closely with them on every step towards the big day to make sure every aspect is taken care of. Apart from venue set-ups and menu tasting, the hotel offers special overnight rates for wedding guests. Additionally, the Oxford Club can also host wedding parties where brides can get their hair and nails done with their best friends.